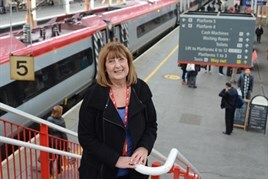 Crewe station will lose one of its most treasured assets when manager Sheila Breeze retires after nearly 17 years working for Virgin Trains. Breeze is regarded by the passenger operator as an ‘unsung hero’. She has run the station for four years, having ‘returned home’ following stints managing other stations. The station itself is one of the most famous on the network, and its history is something into which Breeze has thrown herself. Her background was working in libraries, and when she told her mother that she was moving to VT, it didn’t go down well. Her mum, sadly, has passed away. But as Breeze approaches retirement, she hopes she has made her mum proud. Laughter is something you get a lot with Breeze. But then she loves her job and her team. She says fun is something that should be instilled into the team. Her story telling is also infectious. Is that what happened? “Not quite,” she laughs. Initially Breeze underwent three weeks of heavy-duty training, including safety exams and how to dispatch trains. Then she had to shadow a member of staff for the length of time it takes to ‘pass out’ and be fully qualified. She was one of six doing this at the time. She points to a picture of her during her training with Charlesworth. He’s retired now, but she remains fond of him. “After my break I would be out the front of the station, brushing this and that. Then it would be mopping the concourse.” This was certainly not the glamour she had associated with VT.
“My biggest nightshift fright was the first time I dealt with the ‘Boat Train’. It was a slam-door train that came from Holyhead. It always used Platform 11. Most of the passengers were headed for Manchester Airport. They were usually Irish and not sober. Breeze never told her mother about this first night, but did she ever question what she had done with the career change in those early days? Her next move was to manage both Warrington Bank Quay and Wigan North Western. She then became manager at Stafford, and then both Stafford and Stoke. “I then applied for here . I was very torn at the time, as I had built up a very good relationship at the stations. But I always felt I was coming home here to Crewe. So what has changed since she first started? “The trains are different. And I’m now managing some people who trained me! It wasn’t tricky because when I was with other stations I always travelled through here. There is banter anyway. They joke: ‘I taught her all she knows’. One example was Grayrigg in 2007 (see panel). Another was in February 2014 when Crewe station caught fire. “The fire was horrible. We had a lot of wind. It was a Wednesday and I trended on Twitter… that was a first!” She laughs at the latter, saying it made her son very proud. “We walked around the station and had a look at Platform 12. I have never been hit by something like that. The wind was so strong. We walked the station and heard lots of rattling. My concern was the roof, as it is quite exposed. “Mark then got a call on the radio that a bit of roof was down on Platform 10. This piece of roof had just smashed! There was a hole, and we cordoned it off. Then a bit of Platform 11 went. “It started at about 1600. That was when we started to feel it wasn’t so good. We sent Network Rail some messages that we were concerned. Remember also that there were still trains running and people were trying to get home. Mark said we could evacuate. That was the best decision and he called it. “As we did that, the roof was going everywhere. I was worried someone would get hurt. A piece flew off from Platform 7 and hit the overhead line equipment. There was a bang. It was really loud and that made me jump. There was smoke and flames. “The OLE was then switched off. It was peak time and there was a Pendolino in the station. We had to get them off the train as the OLE was off. It couldn’t go anywhere. We took the passengers to the Crewe Arms. They were great. “The day went into a blur. About 2230/2300 Network Rail gave us the all-clear. Those that stayed, myself included, had to wear hard hats. I did the final check, and a piece of roof flew from Platform 6 and landed on the OLE over the Pendolino. Then it flew back to the platform. The policeman I was with jumped, and I followed. He’s supposed to protect me!” She laughs at that memory. As retirement looms, what does Breeze think when she looks back? What’s she going to do after January 17, when she retires? “I’m thinking of writing a book. It’s in my blood now. I am always talking to people and they want to know what it’s like. It’s like the first time I saw a steam train. I’m from the country - we don’t get them there. I was like: ‘wow’.